Balsamic Vinegar Sesame Chicken Lunchbots Bento, a photo by sherimiya ♥ on Flickr. Chicken and rice, chicken and rice... la la la la laaaa... Is there any more that needs to be said? Well, all right; I'll say a little more. This is the balsamic vinegar sesame recipe I got from Maki at Just Bento, except I used a shoyu substitute and kept it sweeter and less vinegary. I made it before here. It gets divided treatment in this Lunchbots Trio, in a bed of lettuce by itself, next to a cup of furikake rice, homegrown cherry sunsugar tomatoes, and steamed Okinawan sweet potatoes. 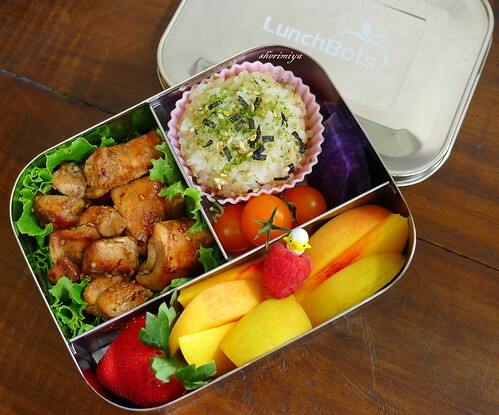 Peaches and berries round out this plain jane basic lunch bento. I've resolved to start with the Halloween bento next week. For sure I'll be able to get in at least a week of spooky scary creepy bento! Or at least a few cute jack-o-lantern ones. Those are my favorite! I was sold at the word vinegar! I'm in, where's my bowl? Hahaa! Oh, and it's not plain Jane at all, it looks gorgeous! I know that problem well. Sometimes my girl eats less than half, depending on who she's sitting next to. Even though they're not supposed to talk during lunch, I'm sure she spends too much time socializing rather than eating. I can only hope she learns to better use her lunchtime over the rest of the year. So glad to have you as my bentobuddy from now on! Ahh, I just sent Nami and email that she should look at your wonderful posts on Bento and see that she's already found your site. Although I don't have small children I love stopping by here to see what fun treats you have packed for your children. Half the adults in this world don't eat as well and balanced as your children. Great posts - always! So sweet of you Vicki; thank you!! mmmm that chicken recipe sounds good! and such cute little homegrown tomatoes. Ah!